When I selected RT4.4 today I wasn’t expecting to settle on Terrapin. I really wasn’t. Glancing through the setlist I had my eyes on Big Railroad Blues and Shakedown Street as possible contenders for today, but I think the anticipation for Shakedown had me overlooking Big Railroad. I was in the mood for something upbeat that really cooked. I actually found the Shakedown to be a bit plodding and lacking the energy that truly makes a Shakedown special. I skipped over Lost Sailor because it’s a skip song for me. It just seem sonically… well… lost in my opinion (excuse the pun) and I can never get into it. Saint of Circumstance picked things up and for a moment I thought that might be the song, but once I heard the opening riff to Terrapin I was instantly hooked. I haven’t listened to this show in quite a while and that Bobby riff just pulls me in every time. It’s amazing how quickly one’s listening desires can change. Here I wanted an upbeat rocker and settled on a more mellow story-song. All the folks over at dead.net clamoring for more 80s releases lately have made me very open minded toward the 80s. That’s not to suggest that I dislike the decade, I like all Dead eras, but I think I’m just a bit more receptive at this point and interested to hear what was going on at the time. This Terrapin is nice and certainly worth a listen. To me, this version of Terrapin is very Brent-centric. Or perhaps it’s more accurate to suggest that Brent’s work on this track is partly why it stands out to me from some other versions. His choice of electric keyboard adds a tone that just seems to fit this version. 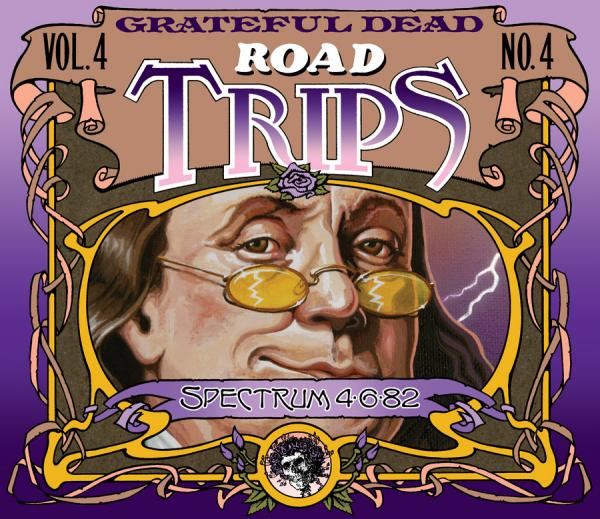 The solo passage between Lady With A Fan and Terrapin Station starts off slowly, as Jerry lays down a line and Brent mimics, and then embellishes the line. In the jam out of Terrapin into drums Brent is again a force on the keys laying down some nice melodic runs. Another reason Brent stands out on this Terrapin is that elsewhere in this show he absolutely tears it up on the Hammond B-3 (e.g. Big Railroad Blues, Truckin’) so the more delicate timbre of the keys and the precision in his playing set this one apart for me. I’m a big fan of Terrapin, especially versions from 1977, 1989, and 1990. I find it good to listen to versions in other eras too though, not only because they’re unique and interesting like this version, but because they make me appreciate the versions that I really like that much more. Tagged 1980s, 1982, Philadelphia PA, RT4.4. Bookmark the permalink. Jerry is a bit marble-mouthed at first but he recovers and begins recounting the classic Hunter tale of the soldier and the lady. When he sings “lost at love” it sounds like “lost at luuuuuv.” Sweet. This is a very gentle rendering. The first solo is really quiet and understated. We return to our story, in progress. When Jer tells us of the storyteller’s job, he says it is “to give life” instead of “to shed light”, which is a significant departure. The next movement gets very introspective, with Garcia just quietly finding reasons to stay on the down-low. The following shift happens at the right time, and again it is fragile yet on-target. Ditto with the “Inspiration” part. It’s just very tame. That doesn’t make it bad. It’s not lazy, just mellow. As the build to Terrapin proper begins, it is impossible to hold the lid on. The band pushes the song up several notches for that crescendo, and Garcia can’t resist digging in a little harder. The final, repeat figures jump pretty well, some of them augmented with the Octaver pedal. Just when you think that the last one has hit, Jerry loudly blasts out a few more. Some are tight, some are stumbly, but it’s all jamming. The band turns its collective back on these proceedings all at once, leaving two guys onstage, known in these parts as Rhythm Devils.